Steering Wheel on the Right? No, on the Left! But Why? 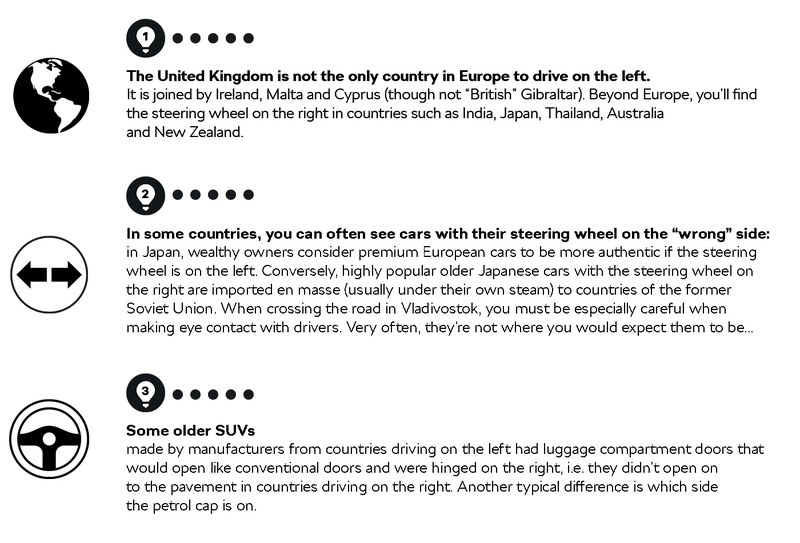 Today, roughly a third of the world’s countries, including India and Japan, drive on the left in cars with steering wheels on the right. Why did the others decide to do the opposite? And what are the consequences for carmakers? As far as the English are concerned, there are no ifs and buts about it when they drive a car: the steering wheel belongs on the right. For most of the world, though, the steering wheel’s on the left. How are the design and development of vehicles different when the steering wheel is on the other side? First off, numerous adjustments have to be factored into the development of a new car. 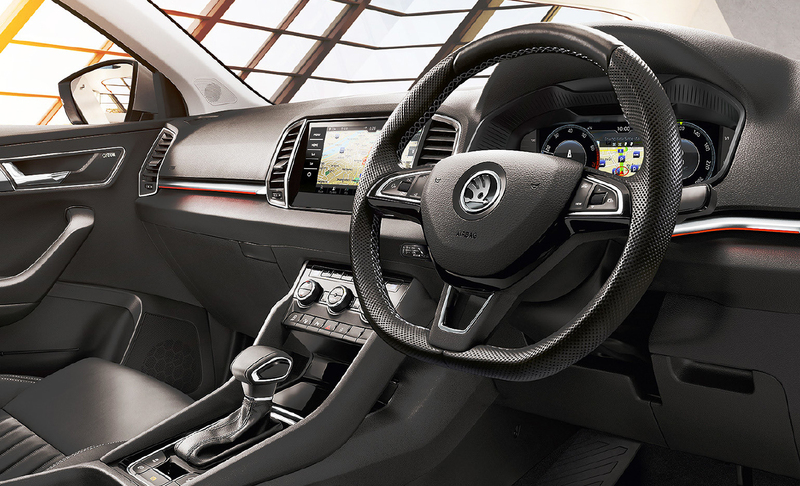 Besides the obviously different dashboard and steering column, the layout and design of individual components at the front end of the car have to be taken into account. In addition to the steering gearbox itself, modifications also need to be made to the brake servo and the clutch, brake and accelerator pedals (although these have the same layout in both versions, i.e. accelerator on the right, brake in the middle and clutch on the left). Other parts, such as cables, hydraulic and vacuum brake hoses, are usually linked to this. This is why parts of the bodywork are also different in this part of the car. On the other hand, the different location of the steering wheel does not complicate the production process at modern facilities in any way. Right-hand drive ŠKODAs are incorporated into the normal flow of the production line. Assembly technology has been designed so that the same technology is used for both versions as much as can be. Even so, some assembly devices are specific to right-hand drives on account of certain geometrical differences. In all cars, for example, the gears are shifted the same way, i.e. first gear is always top left, not mirrored. On the other hand, certain control levers may be the other way round in cars where the steering wheel is on the right: the wipers are on the left and the direction indicators are on the right. However, this does not apply to ŠKODA cars, which always feature the same control set-up. ŠKODA introduced an interesting feature in the second-generation SUPERB (2008-2015) in response to whether it was right-hand or left-hand drive. With AFS bi-xenon headlights, it was already possible, a decade ago, to switch the luminous flux to right/left-hand drive via a simple user change directly in the trip computer thanks to the headlamps’ modern design. Not only did it simplify the production, but the owners of these cars also avoided the inelegant obligation to put stickers on their headlights when driving from the Continent to the UK or vice versa. These headlamp stickers stopped oncoming traffic from being dazzled. Today, all ŠKODA models with bi-xenon or LED headlights have this handy feature. Consequently, you can prepare your car for safe driving on the “wrong” side of the road (whether left or right) yourself in no time at all. We know from history that, even two thousand years ago, it was important to have order in transport. Until recently, scientists were debating whether the Romans, masters in the construction of stone roads and organisers of massive troop marches, drove and walked on the right or the left. The ingenious network of important roadways over the sprawling empire suggested that clear rules had to be applied in this strategically important area long before the first traffic signs and traffic lights were invented. Ruts worn into a stone road, discovered by archaeologists near a major Roman quarry, clearly showed who was correct: those who had contended that the Romans drove on the left. The deeper ruts, made by heavily laden vehicles as they drove away from the quarry, were on the left side of the road. Coincidentally, this fundamental discovery was made – where else? – in England, specifically near Swindon. In the Middle Ages, people continued to walk and drive on the left. This was a time when those who had the opportunity and reason to travel – primarily the rich and powerful – wore a sword on their left hip. If the left parts of their bodies had passed each other, whether on foot or on horseback, there would have been a risk of inadvertently crossing swords. Incidentally, this is also why stairs in towers twist to the right – so that defenders could better repel the attacks of the climbing assailants, who would have been holding their swords in their right hand. It is believed that, over the course of the 18th century, driving on the right started to become more common on the other shore of the Atlantic, in France and in Russia because economic developments led to the introduction of four-horse carriages. Rather than sitting on a coach box, the coachman would ride on the left rear horse so that he could spur on the team of horses by using his whip on the right. This made it more advantageous for carriages to pass on each other’s left side, giving rise to driving on the right. Whatever the case, by the time of the Napoleonic Wars, the world was cleaved in two, at least when it came to transport: one – the original – half drove on the left, while the “Napoleonic” part of the world drove on the right. So France and the countries in which the famous commander reaped success took to driving on the right, while the rest of the world, with all the more stubbornness, insisted on keeping to the left. The development of motoring in the United States contributed most to the unification of driving on the right. Even here, though, cars continued to have their steering wheel on the right for years. 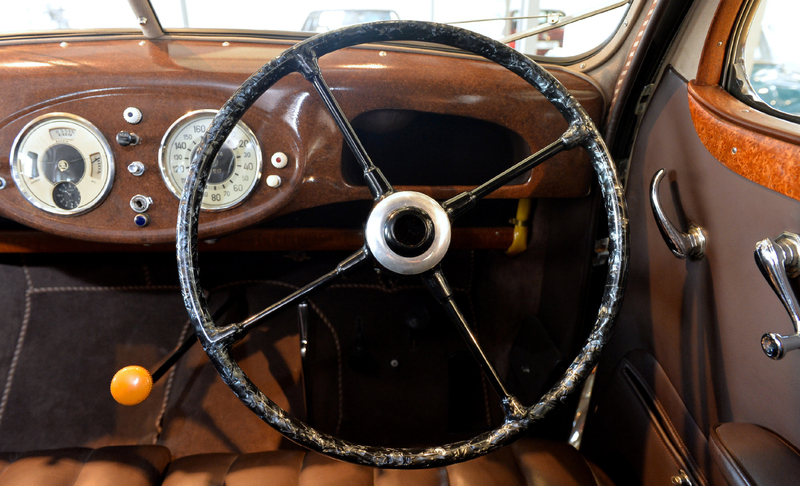 In the early 20th century, the steering wheel began to appear increasingly on the left. This was a natural progression: it enables those who are driving on the right to better gauge how to pass an oncoming car safely, and it also makes it easier for passengers to board from the pavement. Over time, all countries in mainland Europe made the decision to drive on the right. One of the last European countries to do so was Sweden. It did not make the switch until 1967, by which time automobile (and also, for example, tram) traffic was much busier. Even so, the Swedes managed everything unexpectedly quickly – literally overnight, in fact. One evening, everyone parked their cars on the left, as dictated by the old law, but in the morning they set off on the right side of the road. Having said that, this switch-over had taken several years of careful planning. A steering wheel on the left! Why?